It’s only Wednesday but my bag is so heavy! Seventeen Instant Glow Shimmer Brick in Gold Bronze – I’ve been using the darker colours on my cheeks and the lightest to highlight the cheekbones. Body Shop Mirror – I love this as it is so sleek. It’s battered because I bring it everywhere! Soap & Glory Smoulder Kohl waterproof eyeliner in Aquabat – the green I have been wearing on my lower lashline. Lancôme Le Crayon Khol in Silver 025 – my grey-silver brightening eyeliner. Barry M lip liner in 2- hot pink worn with my French Touch lipstick – applied around the edges of my lips after applying the lipstick. Bobbi Brown lip liner in Rich Cocoa to go with my Hot Cocoa lipstick. Lancôme Le Crayon Khol Black Gold – an old limited edition eyeliner which I probably shouldn’t have but can’t bear to throw away as it is black with gold flecks which turns the liner into a subtle black – great for daytime. Bobbi Brown eyeshadow in Mahogany 10 – this is my ideal eyebrow colour. Bourjois Khol & Contour eyeliner in 13 Argent Creatif – I’m not sure if you can still get this white-silver eyeliner. I use it to highlight and brighten my eyes. Bellapierre dual brush – I use the angled liner to define my brows. Maybelline Baby Lips in Minty Fresh. Cowshed Cow Pat moisturising hand cream. L’Occitaine subtle violet hand crea . Nivea Lip Butter in Vanilla & Macadamia. The lip butter is my handbag staple and I usually only carry one hand cream but I was testing them to review them soon on my skin blog. Essie apricot cuticle oil – a handbag essential for taking care of my cuticles. OPI Nail Envy Original – some of my nail colour chipped off and I needed to protect my nails. Barry M Gelly Hi-Shine Nail Paint in Blood Orange. Barry M Nail Paint in Yellow Topaz. Revlon quick dry top coat. I had this crazy idea that I would be able to fix my nails at some point during the day! I’ll be reviewing all of these on my nail blog. Phew! 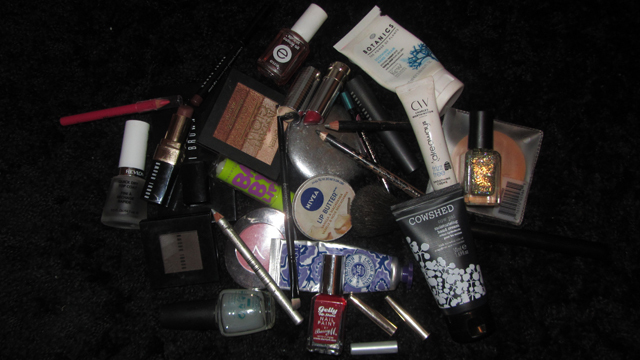 Far too much stuff so I’ll be sorting this out tonight!